Fall is my favorite time of the year to break out the crockpot! The weather is just starting to change, the nights are cool and daylight savings is right around the corner. Meaning, that it will get dark earlier and I will look out the window and lose track of what the heck time it is! This is why I love utilizing the crockpot during this time of year. I can prep everything early, turn it on and forget about it. Another bonus is that the whole house will smell delightful all day. 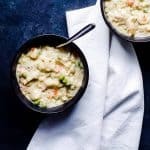 This Crockpot Chicken and Dumplings with Biscuits is perfect because it packs a ton of flavor with a lot less work than a traditional biscuits and dumplings recipe. How To Make The Best Crockpot Chicken And Dumplings with Biscuits? The key to the best Chicken and Dumplings recipe is the combination of spices, the dumplings, and the add-ins. My grandma will say that the key lies in the dumplings. Which she was taught to hand-make and hand roll. While I adore her dumplings it is not realistic to roll my own on a regular basic. Therefore, I came up with a quick and tasty alternative that packs flavor and saves time. I love that this recipe can accomplish so much with so little effort! That being said there are a few key points that make this chicken and dumplings recipe perfect. First, I use Grands Biscuits for this crockpot chicken and dumplings with biscuits recipe. It doesn’t matter if they are off brand or name brand just make sure they are the big guys. I love using biscuits as the dumplings because it saves so much time and prep work. I have a great appreciation for making things from scratch, but in this case I like the shortcut better. Personally, I like to combine everything in my crockpot except the biscuits and have it cook for about 4 hours on high. Then I add the biscuits and continue to cook on high for another 1-2 hours. I have found that if I add the biscuits from the start they dry out. The result of waiting till the last couple hours is a creamy and perfect biscuits and dumplings texture. Also, the flavor is buttery and tastes like you had spent hours homemaking them. When in reality you saved a ton of time without having to lose out on flavor! I have made this recipe for multiple members of my family and they all agree that the biscuits are a genius hack! If you are looking for a from scratch biscuit, give Grandma’s Classic Southern Biscuits and Sausage Gravy a try! No corners cut there! Second, pick your veggies! Personally, I like to use carrots, peas, and white onion for my veggies. Alternatively, you could add things like celery, potatoes, or even corn. I choose the vegetables me and my family prefer, but you could very well add and subtract to find what works perfect for you. If you use potatoes make sure you remove the skin and cut the potatoes into small pieces no larger than an inch. This is because you want to make sure they cook completely. Hard carrots are the worst. For the carrots I use whatever I have available. I have used frozen, baby, and whole carrots. Whatever you use make sure you slice them in small uniform pieces so they cook evenly. Next, I would highly suggest using frozen peas if you choose that vegetable. I find if you use any other kind they get way overcooked and turn into little green mush balls. Also, when you dice the onion, don’t get too stressed about them being all the right size or super small. The onion will cook down so much you will barley notice them anyway! Finally, if you are using celery finely chop trying to get uniform sizes. Similar to how the carrots are cut and sized. Third, season it up! 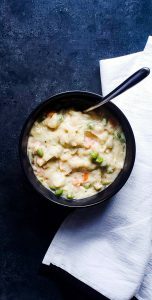 I love the combination of spices that are happening in this Crockpot Chicken and Dumplings with Biscuits! The main notes coming through are thyme and rosemary. These two blend for a perfect combo and give this recipe a punch of flavor. My issue with a lot of other chicken and dumplings recipes I have tried is that they are bland and under-seasoned. Therefore, years ago when I set out to make my own recipe I wanted to be sure that it didn’t blend in or fall flat. The other spice that I love in this recipe is the red pepper flakes. This is an odd one for most I am sure, but the subtle spice it gives really brings the whole thing together! Don’t worry, this is not melt your face spicy! The texture of this Crockpot Chicken and Dumplings with Biscuits is so rich and creamy. Recently, my family and I went to a restaurant and I ordered some chicken and dumplings. I was excited for a warm comforting meal. What I got was a watery mess! Bleh! Personally, one of the biggest mistakes is making chicken and dumplings watery, like a soup. Too me, the perfect chicken and dumplings is thick and creamy! That is why I use milk, and butter in this recipe. I use five cups of liquid total which I feel yields the perfect consistency. If you like your chicken and dumplings more runny, then add another half to full cup of water or chicken broth to the recipe. The biscuits will also thicken the recipe up after they are added. So don’t panic if it looks runny after the chicken is cooked through. Lastly, I love this Crockpot Chicken and Dumpling with Biscuits Recipe because it is perfect for busy weeknights. The crockpot alone is a weeknight dinner life-saver, so I love to incorporate it often, especially in the winter. It works great if you prep in the morning then start it and let it go all day. Then, when you get home in the evening toss the biscuits in and by the time dinner time rolls around it will be ready to go! If you have a programmable crockpot with a timer you can set it to cook on high for 4 hours, or low for 6 hours. Then you can shred the chicken and add the biscuits. I find that it takes at least an hour for the biscuits to cook through. Also, I love this recipe because it is filling and can stretch a long way. 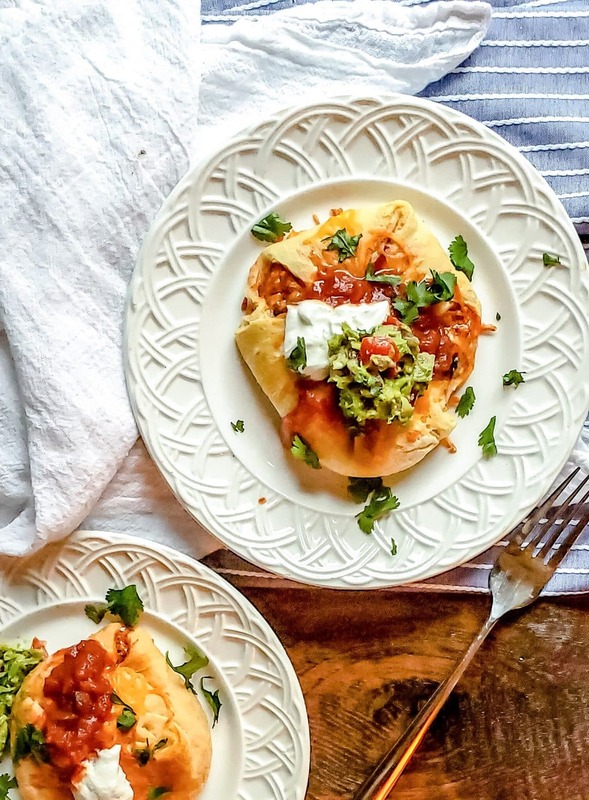 My son, Theo, and I often eat leftovers for lunch, so being able to make a big batch of this for dinner and have it for days after is a huge time saver. I also love that there is a good variety of food groups in this recipe. A couple veggies, some protein, calcium. Theo is on a green veggie strike at the moment, so being able to “hide” some veggies into a recipe is awesome with stingy eaters. I hope your family enjoys this Crockpot Chicken and Dumplings with Biscuits recipe! Looking for a cozy soup recipe? Try this Spicy Vegan Black Bean Soup! *I make a commission for purchases made through the links on this page. 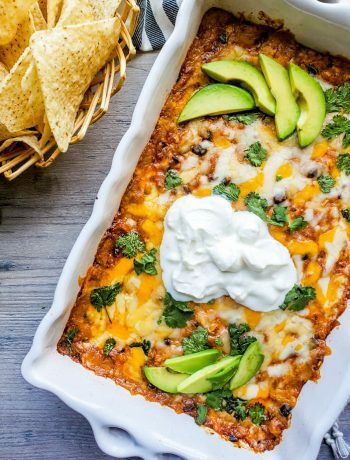 This is the best and simplest weeknight crockpot meal! This chicken and dumplings recipe uses biscuits to cut down on prep time and work without sacrificing flavor! 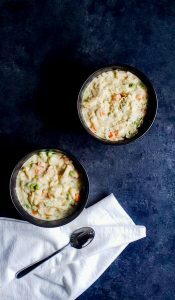 The combo of peas, carrots, chicken, and milk all cook together for a creamy finish! After 4 hours, remove the cooked chicken and shred. Then return the shredded chicken to the crockpot and stir. Tear or slice the Grands biscuits into small pieces (about 5 per biscuits) and add them to the crockpot. Stir to combine. Cover and cook for another 1-2 hours on high or until biscuits are cooked through. Stir before serving warm. Enjoy! Alternatively, store leftovers in an airtight container in the fridge for up to four days. *Or 6 hours on low. Now that is what I call comfort food. My husband would eat this in seconds! It never lasts long in our home! Found this recipe at the perfect time! 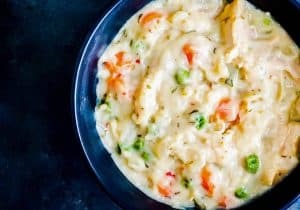 I’ve been craving Chicken and Dumplings and love that this can be made in a slow cooker! Yes! It is the perfect time of year to bust out the slow cooker! Checking the weather… need a cold day to make this ASAP! The second the weather turns cool this is one of the first recipes I make! I love meals like this in the fall, or actually anytime of year! Sounds so comforting and warming with the flavors from the garlic and herbs. Yum! This looks so comforting and delicious!! Just. Need a warm bowl of this chicken dumpling..as the weather starts to cool off! Yes! I love to make this as soon as the weather cools!